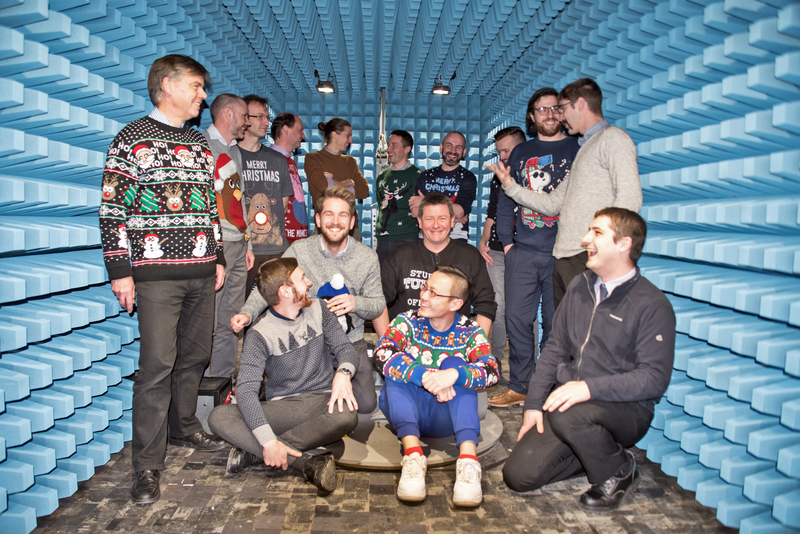 Festive greetings from our innovation team who have getting into the spirit with a charity Christmas jumper day – and what could be a more perfect location to pose in than our new Anechoic EMC Chamber. The R&D team, including Dr David Jones, Innovations Director (left), can be seen in the newly installed chamber that allows on-site testing of electromagnetic emission and interference as part of the design and validation process. “It represents a significant part of the continuing and growing investment in research and development and our highly skilled innovation team,” said Edd Rayner, Invertek’s Innovation Projects Manager. Staff throughout Invertek’s headquarters at Welshpool, Powys, UK took part in the Christmas jumper day last Friday, with money raised going to the Save The Children charity.